Events: 100, 200 and 400 Meters and relays. Career Highlight: Mark Hastings played linebacker for West Orange High School and didn’t even run track then. He is a late comer to track, but has excelled since becoming a master sprinter. Mark set PR at the Charlotte Masters Outdoor Nationals in the 100m and 200m. He filled in for Bill Collins in the 4 X 400m at that meet, and won the 50-59 age group gold and they almost beat the 30-39 year old team. There he earned his nickname of “White Lightning.” He has also garnered gold medals on the Houston Elite Relays teams at the famous Penn Relays. 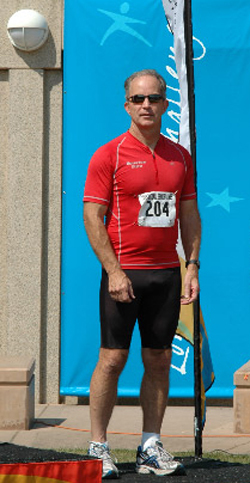 (In the photo to the right, Mark is on the Medal stand for a performance at the 2009 Senior World Games in San Francisco). Recent Performances: In the World Masters Outdoor T&F Championship in Sydney, Australia, he made the finals in the 100m (4th place), the 200m (5th place), and the 400m (9th place) and won Gold has part of the Houston Elite relay team (Which won the 4 X 100 by a step). Not bad for a former football linebacker. The Latest: Mark’s next goal is to lose additional weight, strengthened his lower legs and increase his quickness out of the blocks. All designed to get him to his next PR in the sprints.